Bepza Public School & College (BEPZA) published new job circular in there official website at www.bepza.gov.bd . Today daily newspaper Jugantor also published this circular on 24 October 2016. Eligible candidates should be download application from www.bepza.gov.bd. official site and send to Sub Secretary (Administration) by 10 November 2016. 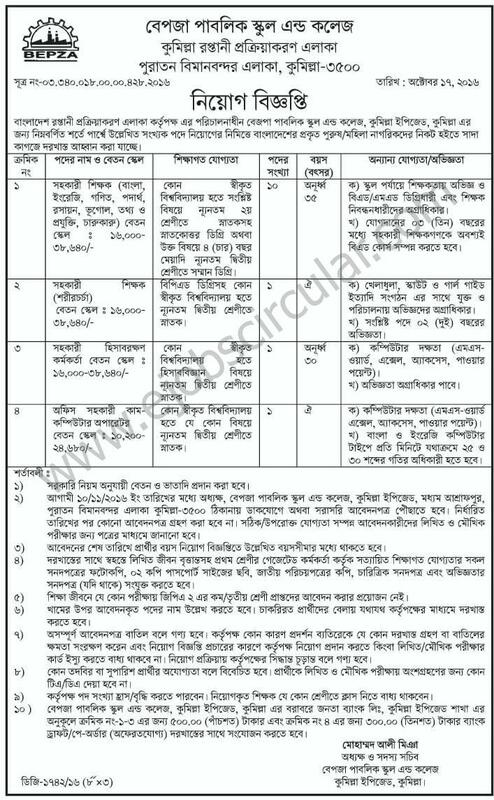 Bellow you have to see the BEPZA Public School & College job circular details or visit www bepza gov bd. BEPZA and Application Form download information below this original circular. Hope you Read carefully this circular. Now prepare yourself for apply this BEPZA Recruitment October 2016 Jobs. This entry was posted in BD Govt Jobs 2019, jobs Newspaper, Jugantor by Raju Ahmed. Bookmark the permalink.